Just some of the things that make the ecobee4 great. It’s not an easy choice nowadays in 2019. Nest and Ecobee have both continued to up their game, but they’re both struggling with the same things: server reliability (Ecobee moreso than Nest), integration with larger home automation systems (Nest’s is more robust, Ecobee supposedly has a camera on the way), and standing out in an increasingly crowded market. 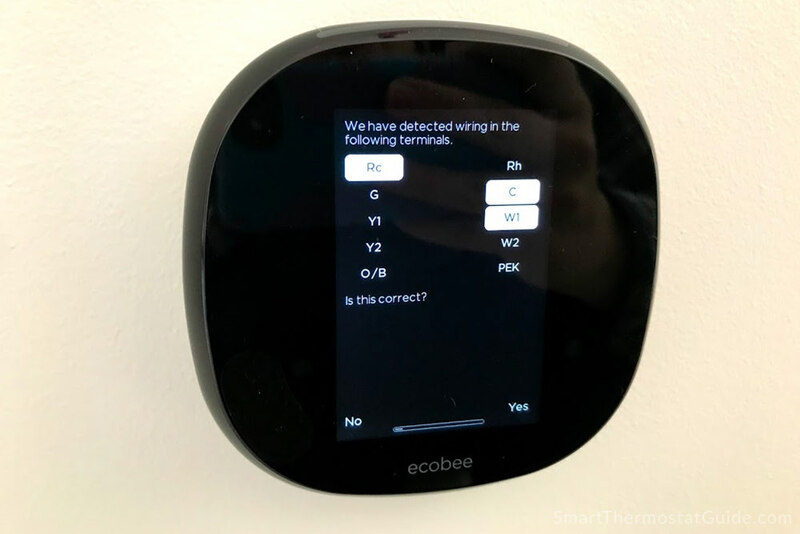 Ecobee used to distinguish itself with room sensors until Nest added them in early 2018, but Ecobee’s are still better (in our opinion) because they aren’t beholden to set-in-stone time periods and because you get one for “free” in the box with your ecobee purchase. The ecobee4’s claim to individuality right now is its on-unit Alexa integration (you can talk right to the thing), but the novelty wears off after a few months and once your routine is set. It’s 2019 and we’ve updated this article from top to bottom to bring you the latest news about the ecobee4 and help you make a choice for your home. 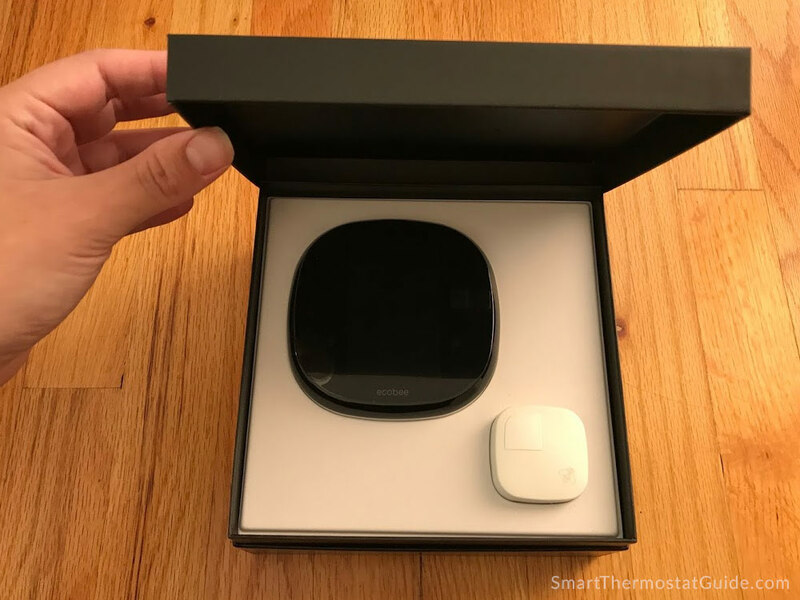 Who we are: independent and unbiased tech enthusiasts who buy, try, and review these thermostats with our own money out of love for home automation and technology. We’ve never accepted freebies and all photos are our own unless otherwise noted. 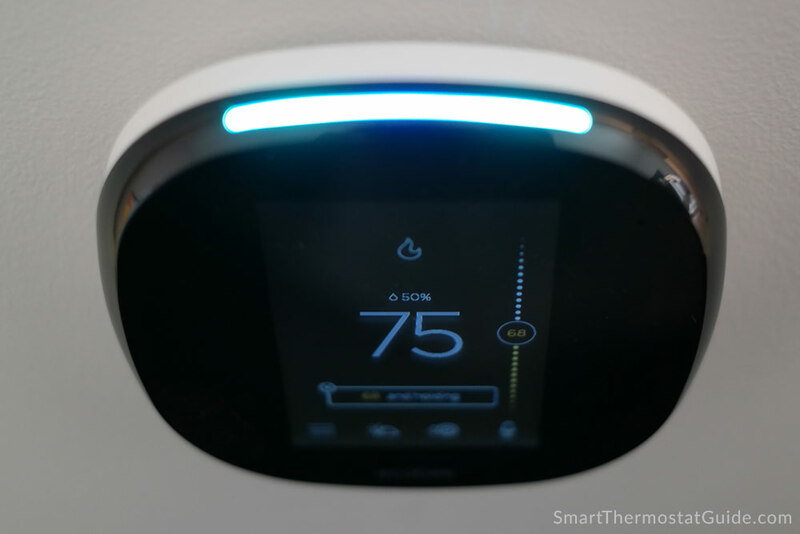 We source opinions from local HVAC installers and friends and family who have been long-term (year+) users of various smart thermostats. This review is intended for visitors in the US and Canada. We hope you find our site useful and we welcome your comments and corrections. It’s easy to schedule. 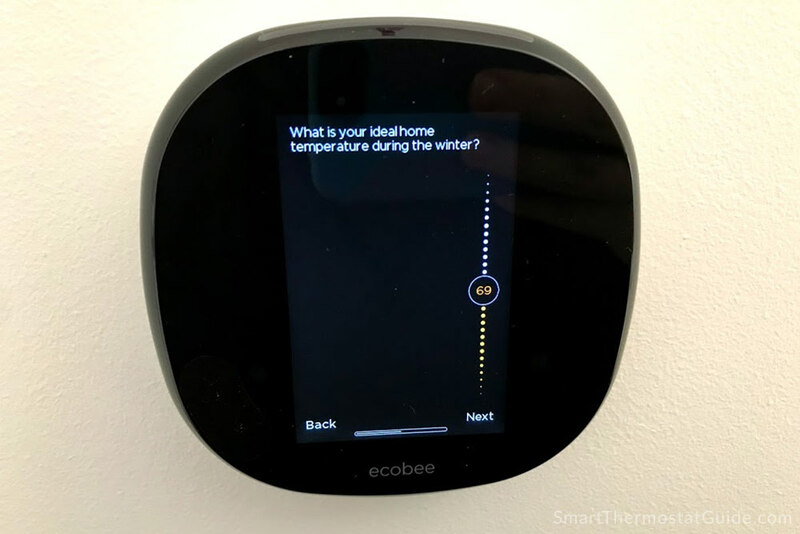 Every smart thermostat on the market today is easier to schedule than the tiny-LED-screen programmable thermostats from 10+ years ago, but the ecobee shines on scheduling because you get complete control. You aren’t limited to a particular number of adjustment periods per day and you get tight control over the swing range (1 degree). The ecobee4’s room sensors are reliable and useful. One sensor is included in the box and you can add more if you like. It’s a small, unobtrusive plastic square that runs for well over a year on battery power alone and monitors the temperature in whatever room you place it in. It communicates a temperature reading back to the main unit, which incorporates the temperature data in heating/cooling decisions. The sensors also act as motion sensors, so on days when your schedule deviates from the norm and you find yourself home, the thermostat picks up on that (or you can set it to “Follow Me” by default). Place a sensor in whatever room(s) you deem “mission critical” and the ecobee takes it from there. 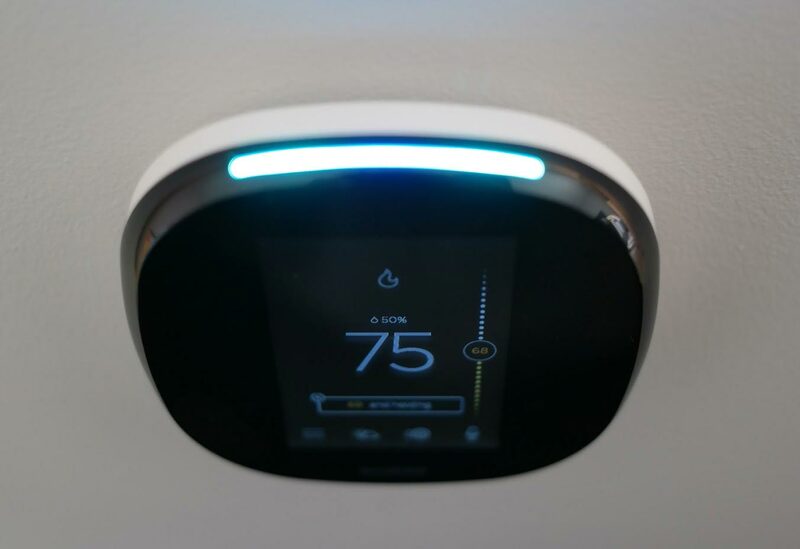 The ecobee4 has excellent HVAC compatibility, possibly the best on the market right now. Every ecobee model ships with a Power Extender Kit in the box and it’s easy to wire it up in your furnace if you need to. We prefer the PEK to Nest’s “just try it and see what happens” solution to dealing with installations that lack a C-wire. The (free, automatic) HomeIQ report delivers a summary of your HVAC’s runtime each month. This can be useful in figuring out why your HVAC is running when it is, but mostly we think of these as something to browse (briefly) each month when they come out. They are not always timely and they are not the end-all, be-all of HVAC data. ecobee4 integrates with all major home automation systems, including Google Assistant. Even though the ecobee4 has Alexa built into its hardware (it’s like getting an Echo Dot for free inside your thermostat), the ecobee4 still works with other home automation systems including Apple HomeKit (Siri). The ecobee4’s Alexa also works in Canada. Nice touches and extras include a clock on the idle screen, “ESP” to help the thermostat’s built-in Echo distinguish which Echo you’re talking to in a room that has more than one, and alerts for maintenance reminders and temperature readings outside the desired range. If you decide you don’t want Alexa in your thermostat, it’s easy to turn it off and you no longer incur the bright red always-on light that bothered many customers at the ecobee4’s launch. Having Alexa built into a thermostat is a neat novelty, but it’s a novelty that wears off after a little while (for us it was about a week). The “good” here is that it’s fun and easy to adjust the temp on the fly using only your voice. We did this a lot in the first few days with our ecobee4, but then we settled on a schedule we like and didn’t really adjust it from there. There’s only so much of my life I want to dedicate to tweaking a thermostat’s schedule, but at least the ecobee4 makes that easy and painless. Here’s a downside you might not like: since anyone in your home can speak to Alexa and have her carry out a command, this means anyone in your home can control the thermostat and bypass the 4-digit PIN (if you have one on your ecobee) from anywhere in the house. If you want to maintain iron-clad control over your home’s temperature for whatever reason, then you’ll want to disable Alexa or consider a different thermostat. As for the “meh”, well – it’s just a crappy Echo Dot stuffed into a thermostat. Don’t expect a miracle. If you live with someone named Alex or similar (like we do), expect misfires during normal conversation. It even picks up certain chains of words and phonemes and interprets them as “Alexa”. All Echoes have this problem, and it’s why people change the wake-word to Echo or Computer, but you can’t do that with the Alexa built into the ecobee4. You’re stuck with “Alexa”. Sound quality is abysmal so you won’t even care that it doesn’t integrate your favorite music service the way fully-fledged Echoes do, but other Echo things are missing, too – such as messaging. We got tired of it misfiring when we talk to our daughter Alex, so we disabled Alexa in our ecobee4 though we kept the Echo integration so we can still control it from the Echo in our bedroom (where we talk about our daughter by name considerably less often). We also have it set up with our Google Home (which doesn’t seem confuse anything with “Okay, Google…”) and it works fine through that, too. If you don’t want Alexa in the hardware, you might want to pick up an ecobee3 while there’s still some stock left. 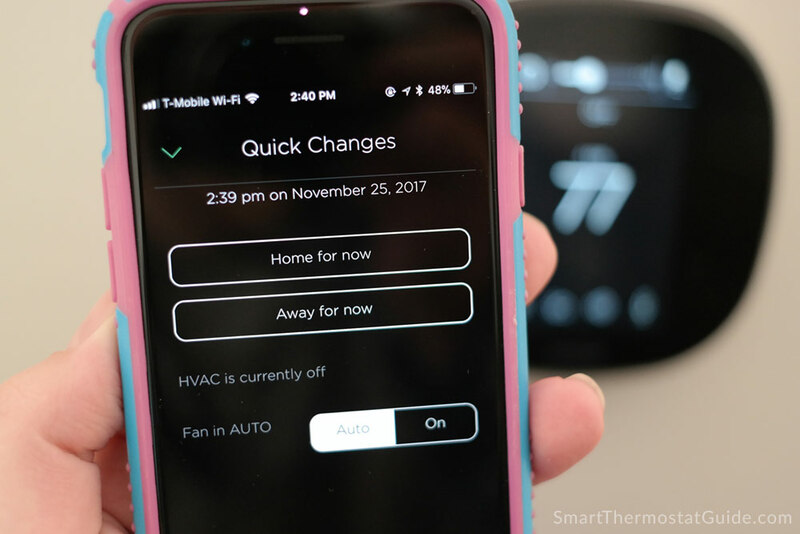 It’s not quite the exact same thermostat – it gets firmware updates at a different pace than the 4 – but you can sometimes find it at a bargain since it was effectively discontinued a couple years ago. The ecobee4 box is thick, sturdy, and has a sort of “buttery” quality to its texture. One temperature sensor is included, along with a PEK (under the top layer). 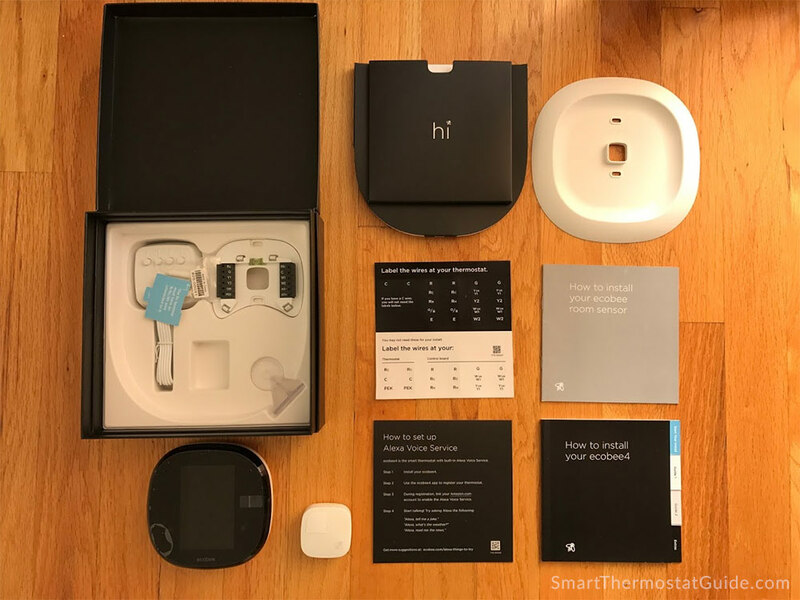 The ecobee4 box contains everything you see here: ecobee4 unit, one room temperature sensor, a backplate with terminals and bubble level, an optional wall plate, instruction manuals, and a Power Extender Kit. The app walks you through installation with animations and diagrams. Overall, it was easy to follow (and we have a toddler adding layers of challenge to every home project). A photo of the nearly-complete installation: the wires lock into place when pushed into the terminals. The screen isn’t *quite* as high-res as a modern smartphone, but it’s pleasing in person and easy to read. A few simple questions about your preferences and you’re done. We’re old, and we’ve been through plenty of complex installation processes. This wasn’t one of them. Linking the thermostat to the ecobee app was easy. Just enter the 4-digit code given to you by the thermostat and it’s connected. Setting up Alexa was easy, too – just enter your Amazon credentials and she’ll start responding. You’ll have to add the ecobee as a device in your Alexa app, too, but once that’s done you should be able to issue voice commands. It’s kind of weird that the built-in Echo doesn’t “know about itself”, but we got through this after only a moment of confusion. The thermostat itself has settings you can adjust… but some of them aren’t available in the app or the web portal. Confusingly, the settings you can adjust for your ecobee vary based on where you access them from. This had us utterly baffled for a little while. We knew we saw a setting but we couldn’t find it again. Surprisingly, the app offers the least amount of access to the thermostat’s settings. You can mount it or attach it to on an (included) plastic stand to prop it up. The included room sensor is small, wireless, and easy to forget about once you place it somewhere. You can add up to 50 to your thermostat. 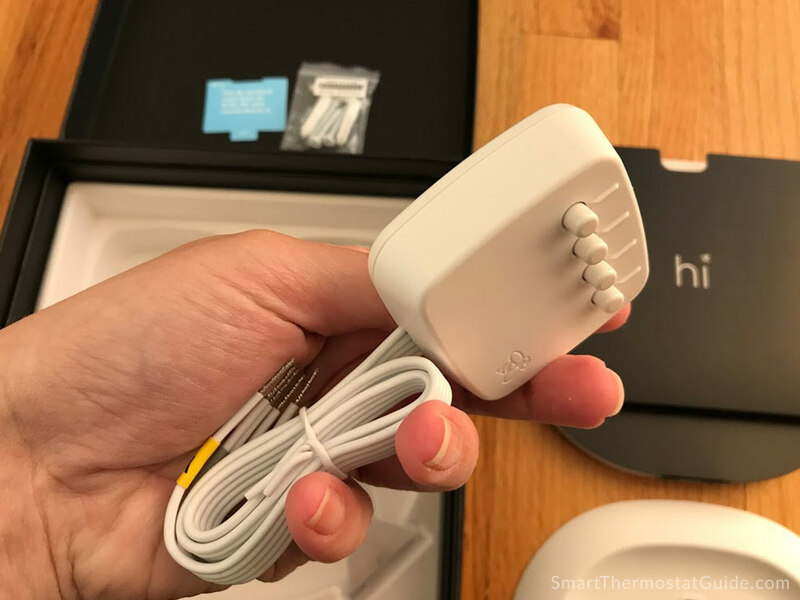 The sensor reads the temperature of the room it’s in and reports it to the thermostat, so the thermostat can better determine if more heating or cooling is needed. Think of it like telling your thermostat which rooms you really care about (and when). 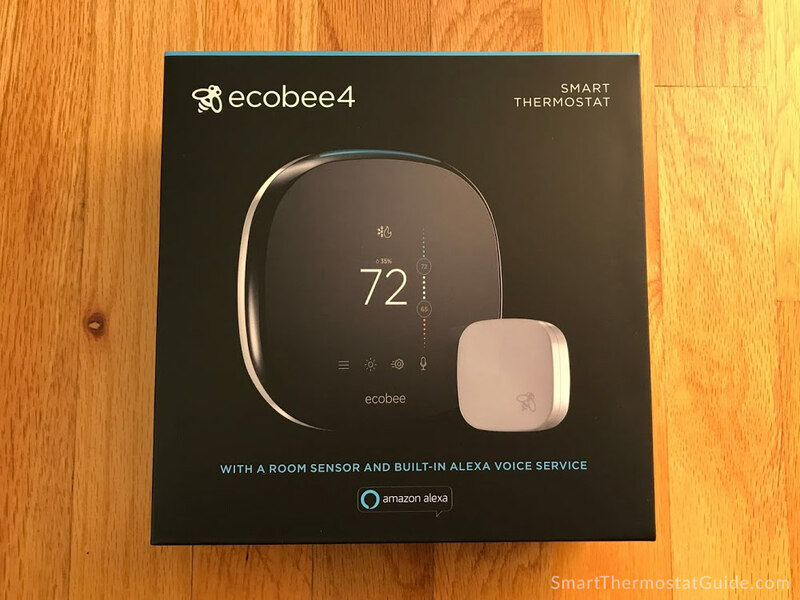 Just be aware that the ecobee4 and its sensors don’t actually equalize temps across your home or fix your perpetually cold room without turning your warmest rooms into saunas. It can’t do that. The ecobee4 can’t make up for a strained HVAC system, a home that’s all windows on one side, poor/uneven insulation, etc. Most of the time you’ll run the ecobee with a schedule, but if you want to base its actions on whether you’re home or not you have some options. The room temperature sensors are also motion sensors and can be used to determine if someone’s home. The ecobee4 also supports geofencing, where it uses your phone’s location to determine whether you’re home or not. Here’s a great potential use for the sensors: imagine that your home office is always cold compared to the rest of the house. You place a sensor in your home office so that on days when you work from home, your ecobee knows you’re there – and runs the heat until your home office is at your desired temperature. You stay comfortable all day and you don’t even have to fiddle with the thermostat’s day-to-day programming. No overrides needed. We placed our one and only room sensor in our daughter’s room, so it was pretty useless at knowing when we were home since neither of us really goes into her room outside of wake time and bedtime. Geofencing was reliable, but with one of us working 30 miles away and the other working at home (and running errands within 1-2 miles, not enough to leave the geofence), the feature wasn’t super useful for us. I could see it being excellent for a family that leaves at different times and commutes 5+ miles from the home for work/school before returning home at different times. Your mileage may vary. The ecobee4 integrates with pretty much every major home automation hub, including Apple HomeKit. You can use this integration to develop more elaborate routines, such as setting a temperature and turning on lights when you enter the geofence around your home. Even though Alexa is built in to this thermostat, you can still control it via other Alexa-enabled devices. For example, if you’ve got an Amazon Echo next to your bed you could tell that Echo to raise the temperature a few degrees and your ecobee4 will still get the command. You can dump all this data to CSV and run your own analysis on it, too. Close-up shot of ecobee’s Power Extender Kit. One is included with every Ecobee thermostat model. Pictured: ecobee app running on an iPhone 7. The app also ran smoothly on our Pixel 2 test device. The ecobee app guided us through the installation and makes it easy to set up a schedule. The app doesn’t give full access to all of the thermostat’s features (you’ll have to stand at the unit for that) and it doesn’t include any kind of usage reports. You’ll have to log into the ecobee website to see your HomeIQ reports. 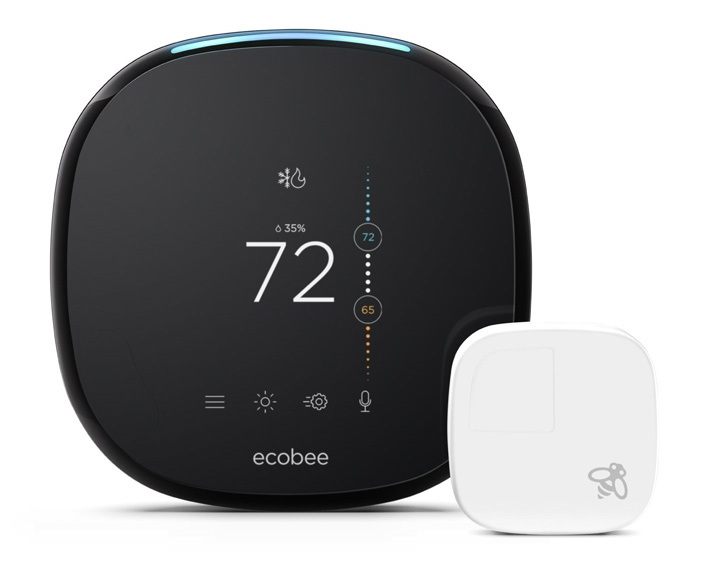 Smart Recovery is the name Ecobee has given to its thermostats’ ability to learn how long it takes your home to reach a desired temperature and start pre-heating or pre-cooling in advance. If you want your home to be 70 degrees by the time you arrive home at 6:00pm, it will look at your home’s current temp and start heating at say, 5:20 to make that happen. 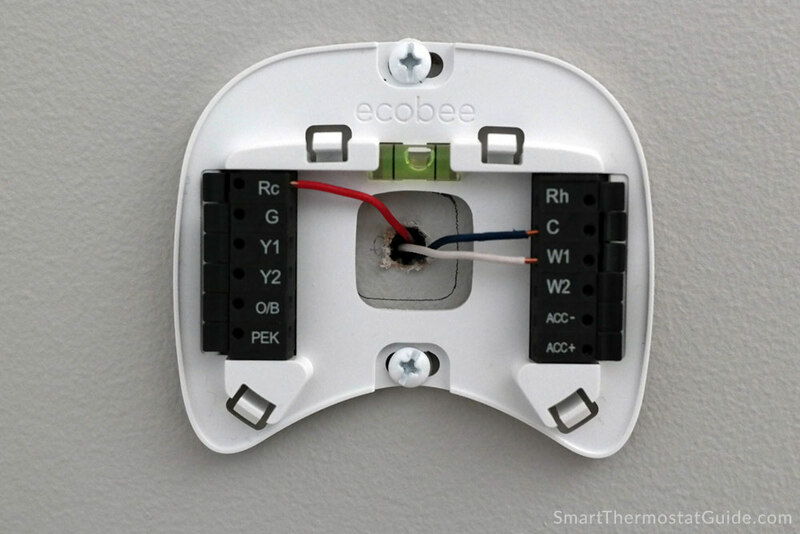 You can read more about how Smart Recovery works here on the ecobee site. If you are using the ecobee4 for a vacation rental (or maybe you have someone in your home or office who doesn’t understand the concept of energy bills), you might be happy to know that the ecobee4 offers some control over who can adjust what settings. However, anyone who is logged into the app can bypass these controls. There is no way to set it so that certain app users are restricted in certain ways. Also, if you integrate the ecobee4 with Alexa, then anyone who can speak to Alexa can raise or lower the temperature that way. As we said earlier, the November 2017 firmware update took care of some of the more pressing Alexa issues: you can now disable the microphone without incurring the always-on red light of doom and ESP is They even added the clock back onto the idle screen! If you don’t have a smart thermostat, the ecobee4 is an excellent choice – especially if you are already a fan of Alexa. We think you’ll love it, for all the reasons detailed in this review. This is the most fully-featured thermostat on the market right now and it supports a mind-boggling array of home automation systems. Monitoring your home remotely is a huge plus – we often use our smart thermostats to “check on” our home’s temp when we’re away during exceptionally cold weather. 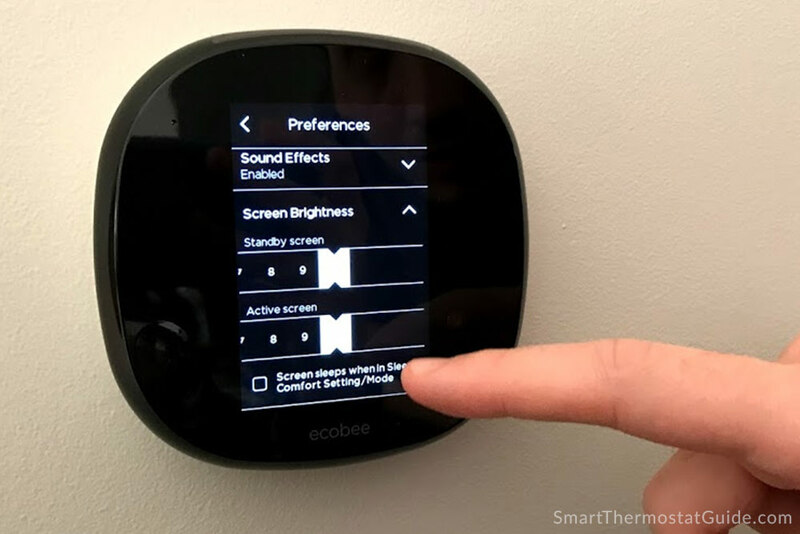 If you have a Nest, you wouldn’t be alone in switching to an ecobee – many people who go from Nest to Ecobee say they love the bigger screen, the straightforward scheduling, the room sensors, and the ecobee’s better ability to deal with one-off changes to your daily schedule. The only folks who might not be best served by upgrading to an ecobee4 are people who already have an ecobee3 or ecobee3 lite and at least one Amazon Echo device. 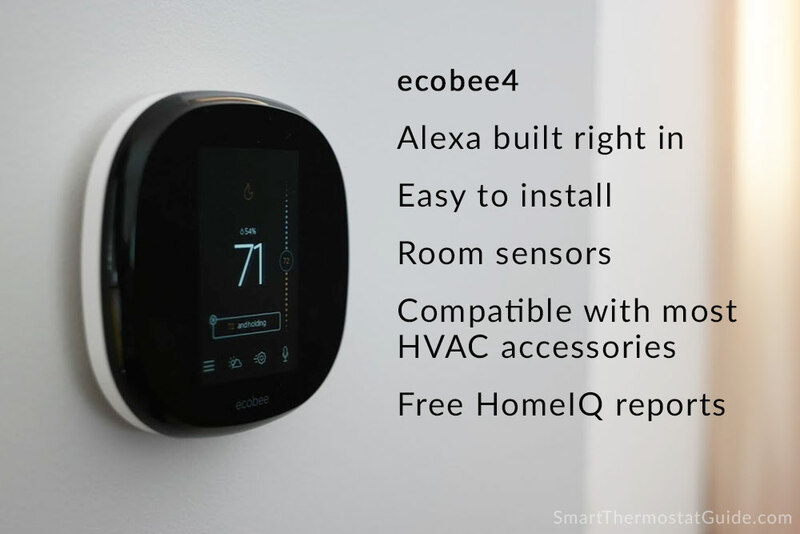 If you have this, you have everything an ecobee4 has to offer minus Alexa inside the thermostat itself. If the ecobee4 is right for you, go ahead and pick one up – we think you’ll love it. With its smart sensors, a multitude of control options, ease of scheduling, and the convenience of Alexa built in the ecobee4 is a winner among smart thermostats. Like all smart thermostats, the ecobee4 is affected by occasional server outages, so it may not be your perfect remote home-monitoring solution. (It continues to operate your HVAC without server access, but you lose the ability to control it from anywhere via the app or website.) The included Power Extender Kit makes the ecobee4 the most widely compatible smart thermostat on the market today. 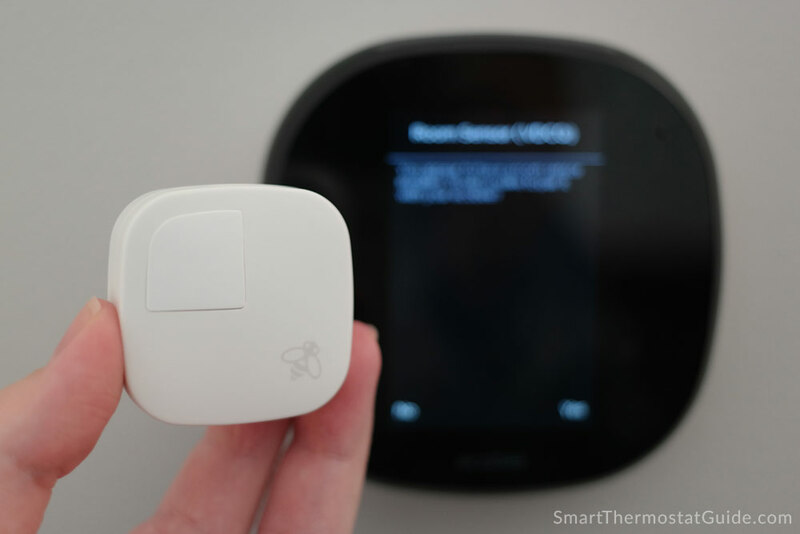 Overall, the ecobee4 is our favorite and we highly recommend it. Server outages make it a little "dumb"
You forgot a very important feature it doesn’t have that it should. Bluetooth. Unlike an echo dot, you can’t connect to a speaker or pair your phone or tablet with it. Since listening to music is a key function if Alexa, being forced to listen to it on a tiny speaker was a big oversight.